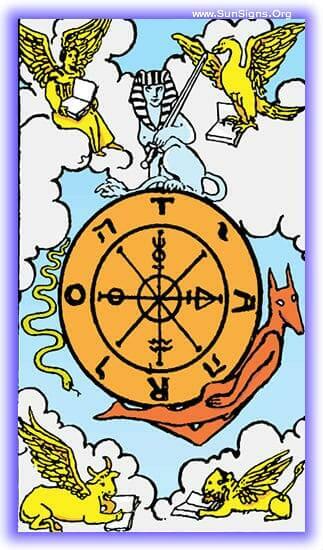 This tarot meditation of the Wheel of Fortune card is about the inexorable drive of fate and destiny. All of us come to a point in our lives where our direction seems led by another’s hand. This meditation is going to lead us down the path of predestination, and how the path gets laid. It will also touch on the power of Powerlessness. As you settle in to meditate on this subject, place your cloth and candle in front of you, and lay this Major Arcana card upright. Feel the hand of destiny on you, guiding you into the meditation with the inexorable feeling of supreme powerlessness. Know as you fall into the meditation that no action you take at this time has meaning, the cards are already dealt, the die cast. You find yourself upon a hillside, eyes gazing out into the valley ahead. A low rumbling can be heard in the distance, and the sky is a clear crystal blue. Over the distant horizon you see the turning of a great wheel, upon its rim are murals, spelling out a tale. The entire wheel is covered, and the story is complete from beginning to end. Within the wheel you see a group of people. Most of them those are whose images are painted on the outside. They walk within the wheel, assisting it on its unstoppable journey to its inevitable conclusion. They continue walking, working with the wheel as it goes to ease their journey over the rough uneven territory below. As it nears, you hear lamentations coming from the direction of the wheel, occasionally with cries of agony. Figures become clear at the base of the wheel. They are struggling futilely in front of the wheel, attempting to change its course. At best their work is worthless, changing nothing about the wheel’s path. At worst they are crushed in the wheels path, their cries pained, and then rapidly cut off as the wheel rolls over them. As you watch the wheel go by, you notice that those within are not walking out of hopelessness, but are embracing the power of powerlessness. They have the knowledge that all that they can do, all that needs be done, has been done. They know that the immediate future is in the universe’s hands. There is great freedom in this, as they focus on those things they can change, and ignore the things they can’t. Continue to observe the wheels progress, and the world about it. Within this realm you will find the message for you in this tarot meditation of the wheel of fortune. Write these observations in your journal, paying special note to the tale spelled out on the wheel. Remember, it is important to recognize when the future is laid out, and when it’s time to dedicate your energy to working with the universe, not against it. How To Make Anointing Oil?